Westford is a town heavily involved in its local politics, and two residents who have worked tirelessly to improve Westford are Terry Ryan and Beth Shaffer Morrison. Ryan is a Westford resident truly immersed in Westford politics and is now looking to expand his horizons beyond just Westford. Ryan, who is currently running to represent the First Middlesex District (Lowell, Dunstable, Groton, Pepperell, Tyngsborough, and Westford), has served on Westford’s School Board for six years and is also a member of the Westford Healthy Communities subcommittee. Morrison is an engaged citizen as well. She is the founder of Indivisible Westford, a grassroots organization, and chapter of Progressive Mass, a larger-scale organization meant to facilitate grassroots groups like Indivisible. Morrison is co-chair of Indivisible and uses Indivisible to connect elected officials and candidates to voters in Westford, as well as to push a legislative agenda. Both Ryan and Morrison are deeply involved in local politics, as seen by their resumes, but are engaged in different ways. They have worked to exemplify the democratic process, by being engaged voters and candidates that are involved members of the community. Ryan hopes that his extensive resume will set him apart from other candidates running for the Senate seat. “I just think when you look at the experience, you know, […] like living in both locations [a town like Westford and in Lowell], it gives me a different perspective on the race. I think the fact that I am the only candidate that’s in a non-paid, volunteer elected office right now [sets me apart],” Ryan said. He also hopes to use the experience he has garnered on school board, as the Director of the Merrimack Valley Small Business Center in Lowell, and as an engineer to better improve the lives of his constituency if he wins. Using his school board background, Ryan puts emphasis on education. He titles student success as one of the three prongs in his campaign. 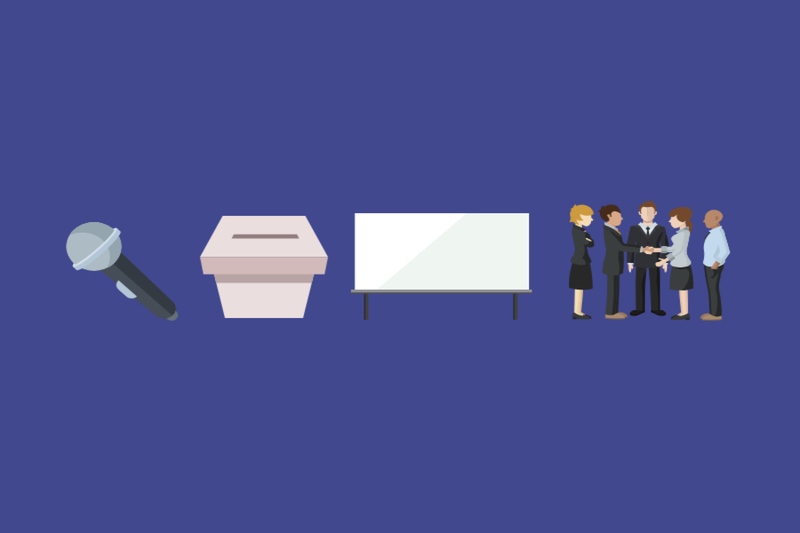 What is the most important issue on the campaign trail to you? “Student success included education not only for children but for adults to make sure that we have a well-educated workforce. I want to make sure that a quality education is available to everyone no matter where they live or go to school” he said. Katherine Desrochers, who’s Ryan’s campaign field manager and a rising junior at Temple University with a double major in political science and strategic communication, resonated strongly with his student success platform when she first joined his campaign. “Student success is a really big part [of what resonated with me]. […] When he [Ryan] was on school committee, he focused on tactics to reduce stress and anxiety for students in the classroom. […] That’s so important to me because I feel like at my university I see a lot of people who struggle with mental health issues and they’re not always properly supported. It’s really hard to pursue an education when you’re so bogged down with stress and anxiety, so knowing that has already been a focus [in his campaign] has been such a comfort to me,” said Desrochers. Desrochers was also pulled to the campaign because of Ryan’s strong commitment to providing schools with funding to better secure themselves. “Knowing that school safety has also been a focus is so important. I’m a Chelmsford resident, but I have a ten-year-old little brother and when you see school shooting after school shooting, it stresses you out,” she said. His second prong focuses largely on economic development, especially in Lowell, as well as the infrastructure needed to support it. “I want to focus on economic development. What economic development is in Westford is different from what it is in Lowell. We need to look at that, and part of that is the infrastructure required. I want to look at what we have to put in place, what we have to repair, and what we have to make available [to improve infrastructure],” said Ryan on his plans to encourage economic development by bettering infrastructure. Ryan’s third and final prong is creating and ensuring healthy communities in the district. Ryan has worked on Westford Healthy Communities subcommittee and wants to help spread the initiative beyond Westford. “[It] covers everything from dealing with opioid addiction and working to resolve those problems. […] Healthy Communities [also] includes […] providing healthcare for people that need it,” he said. Morrison and Indivisible also push a legislative agenda, which Progressive Mass (their parent organization) has compiled. The agenda emphasizes social justice and change, economic equality, and an accountable government. As chairwoman, Morrison has also worked to engage Westford voters and give them time to meet their elected officials and candidates for office by organizing forums. “We have monthly meetings where we bring in speakers on different candidates. We’ve had most of the third district candidates in [our meetings], and next month we’re going to have one of the organizers from the Elizabeth Warren campaign come in to speak about canvassing. […] We’re [also] going to have Josh Zakim who is running for Secretary of the Commonwealth and Donna Adelanto who’s running for the District Attorney position in Middlesex County.” said Morrison, talking about the events they’ve held at Indivisible. Like Ryan’s three-prong campaign, Indivisible follows a legislative agenda to push change in the state. Indivisible has done everything from hosting the aforementioned forums, to canvassing, to demonstrating at the State House. It’s clear that both Ryan and Morrison have worked tirelessly to advocate and push for change locally. But why do they do it? Ryan grew up in Lowell and considers a duty to serve just another part of Lowell’s culture. “I lived there for 39 years, I always had some commitment to public service and giving back. Growing up, I participated in several volunteer positions and always participated in community events and things like that. […] I think being born and raised in Lowell, it’s part of who you are, it’s in your DNA to be interested and involved in politics.” said Ryan. Ryan’s love for politics only grew stronger after moving to Westford, as he wanted to be more involved in the school system. “When I moved to Westford, I was involved with my kids’ softball team and all the sports they played. As they got older and going into the schools, I was approached to run for school committee, and that’s exactly what I did. […] I think you should give back to the community you live in. I think its necessary and it’s important to help the community thrive. That’s why I’ve run for school committee, that’s why I’ve served, and that’s why I am running for state senate.” he said. Morrison, however, fell in love with politics a different way. Morrison’s social work background has always made her interested in seeing how policy issues impact people personally. After having kids, she moved away from the NASW and stayed out of the activist world for a while. However, like many after the 2016 election, she was inspired to jump back in and advocate for change. “After the 2016 election, I was just very upset with the direction that our country was going in and I just felt like I had to do something. I couldn’t just sit at home and let these atrocities happen around me,” she said, reflecting on the beginnings of a new chapter in her career as an activist. Morrison was quick on her feet after the elections and started to organize immediately. “So in January of 2017 I was like ‘Hey, is anyone interested in starting this group [Indivisible] with me?’. After that, we got a group of people together and we went to the Women’s March in Boston together. 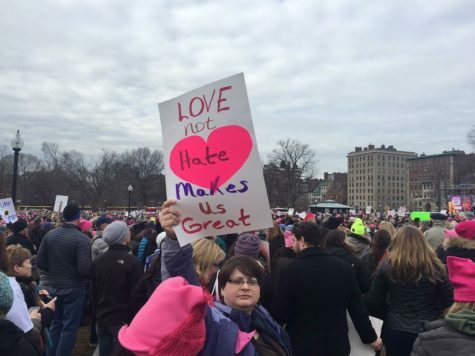 […] We had a good group [around 17 people] and we did the march together, came back and got to work,” she said, explaining how Indivisible Westford formed. Morrison at the 2017 Women’s March in Boston, where Indivisible started. Indivisible has undoubtedly impacted Westford since it’s establishment, according to Morrison. “I think we’ve definitely had an impact in town and people have definitely paid attention to our vigils as they been pretty popular and drawn attention to issues that haven’t really been discussed in town before. So I think overall, we’ve had a good influence. I know that not everyone in town probably agrees with what we’re doing an that’s okay, but I think we’ve had a pretty positive response,” she said. Westford Indivisible has roughly 700 members on Facebook, along with a core group of people that attend their monthly meetings and weekly postcard group. Padma Sonti, Morrison’s co-chair at Indivisible Westford attributes all of the organization’s success to Morrison and her dedication to Indivisible. According to Sonti, it’s Morrison’s education in social work as well as her drive to improve her community that makes her a great leader. “Her education is in this field and she’s very passionate about social work. Not only does she identify the need, but she helps out and follows up with it. […] If a [social] cause comes in front of Beth, she’s gonna evaluate the merits and demerits of it, and very clearly lay it out. She’s gonna tell me ‘Okay, this is where I need you to focus, and this is where I’m going to divide our tasks’. Whether it be rallying troops for a vigil or organizing a forum, she’s on top of it,” she said. Both Morrison and Ryan have promising futures ahead of them in this field and are considered not only as role models for students in Westford but for adults in Westford, too, according to the people like Desrochers and Sonti who surround them. Ryan still plans to be involved in local politics if he doesn’t win this election, and if he wins, he will obviously work to accomplish his three-prong plan and support his constituents. While Morrison herself hasn’t said much about running for office, it is clear that the people around her in Indivisible hope she will in the 2020 elections. Sonti recalled a recent incident in which Morrison was confused for another Beth, Beth Lindstrom, who was running for elected office in Massachusetts. “Yesterday, there was a group of people canvassing for another Beth. So people were under the impression that it was Beth Shaffer Morrison. So somebody posted [on Facebook] yesterday and said ‘Beth are you running for an office that we didn’t know about because there’s someone in town canvassing for a Beth,’. Beth responded saying ‘I think you’ve mistaken me for another Beth,'” said Sonti. It was after that mix-up that more and more people wanted Morrison to run for office. “I said that I need Beth Shaffer Morrison to run for office now, and there were so many other people agreeing, saying ‘yes we do’, too. […] We actually wanted her to run this year for something in Westford town government because there’s definitely a need for her because she’s so thorough and she’s so passionate. But Beth was like, Okay, I need to first know how this stuff operates. So, she’s actually volunteering on one of the town committees as this year to get experience.” she said. As well as receiving support from their respective circles, both Morrison and Ryan commended each other as well. “I think Terry’s a really nice guy, and he’s done great work on the school board and he’s done a lot in Westford. I’m really appreciative of his public service that he chose to do,” said Morrison on Ryan. “Beth is doing a wonderful job getting people in the town involved in politics in general, I commend her for doing that,” said Ryan, when discussing Morrison’s work in Indivisible. Ryan and Morrison have worked tirelessly to improve local politics and change Westford and its surrounding areas for the better. Whether it be through running for elected office or empowering voters to engage in the civic process, both have been described as prime examples of leaders rising up in Westford.